When first approached, I jumped at the chance to create a beer pairing recipe for the New Belgium Brewing Company, makers of the popular Fat Tire beer. I absolutely love pairing wine with food, so why not extend my skills and work with beer? My first stop was Whole Foods, where I picked up a case of Trippel Belgium Style Ale, New Belgium's boldest and strongest beer with the longest fermentation (and highest alcohol at around 8%). The beer opens with a blast of hops that smoothly gives way to complex character, finishing with a spicy punch of coriander. This was a big beer with a big personality, and not for the weak of heart. While the obvious choice would have been to go for meat, either braising or roasting it, I wanted to do something a little bit different. Inspired by the spicy character and coriander flavors, I immediately thought of curry (coriander is one of the major components in a lot of curry), and this led me down the road to Thailand. With such a bold beer, I figured that it would hold up well to the strong flavors and spiciness of Thai aromatics. And instead of meat, I decided that I would steam mussels in the beer itself, finishing them with coconut milk and julienned basil. (Giveaway Closed) Domestic Divas Giveaway: Win Mary's Gone Crackers Full Line of Gluten-Free Products! See all those beautiful boxes pictured above of Mary's Gone Crackers famous gluten-free crackers? You can win them in this exclusive giveaway. And see all of the cookies pictured below? You can win them, too. And see all of "Sticks & Twigs" snacks? You can win them, too. All of them. When I first cut back on eating gluten, I searched long and hard for a great cracker that would make up for all the crackers I was giving up. 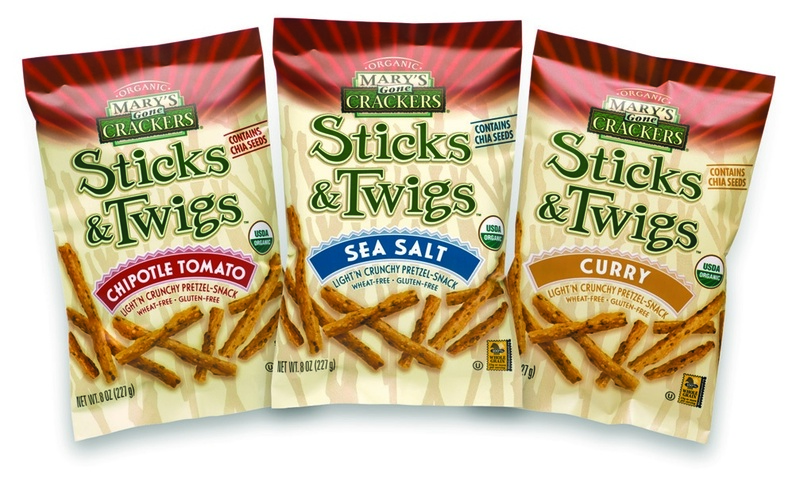 The first time I tasted a box of Mary's Gone Crackers, I fell in love at first bite. How could a cracker made from a terribly healthy-sounding combination of organic ingredients like brown rice, quinoa, flax seed, and sesame seeds taste this great? Simply put, Mary is a cracker-making goddess, and a blessing to the gluten-free world. Check out my exclusive Q&A with her below. You can enter as many times as you want. More entries = more chances to win! The sooner you start entering, the sooner you can start snacking! I'm indebted to Mary Waldner for bringing caraway back to me. When I first discovered that I have a gluten intolerance several years ago, one of the hardest foods for me to give up was rye bread. I loved the flavor of caraway, and missed it like an amputated limb. And then I discovered Mary's Gone Crackers, which came in "Caraway" flavor. They quickly became my favorite crackers, and I've never looked back. I met up with them at the Natural Products Expo West and confessed my fandom of their crackers. 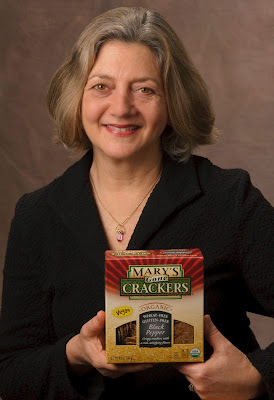 In this exclusive Q&A, Mary Waldner, the founder of Mary's Gone Crackers, talks to Domestic Divas about how she came up with her famous cracker recipe, what it's like to live with Celiac disease, and what her favorite flavor is. If you follow my blog, then you know that I love my slow-cooker. It's any domestic divas best friend for life. It's inexpensive to buy (many costing only around $30) and simple to use. Just toss a bunch of ingredients in there in the morning, and by dinner time you have a fabulous dinner waiting for you. Who can argue with that? In fact, when my cupboard is running low, and I need to throw a yummy and healthy dinner together, vegetarian chili is one of my staple recipes. Most of the ingredients for this chili are found in my (1) cupboard (canned beans, broth, canned tomatoes, chili powder, cumin, cocoa powder, cinnamon); (2) pantry (onions, garlic); or (3) freezer (roasted corn). However, from the flavor this recipe packs, you'd never know that it was a last minute throw together dish. 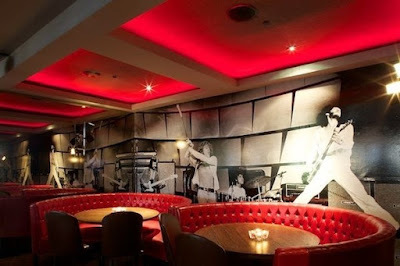 The brand new Rolling Stone Restaurant & Lounge opens at the end of the week in the Hollywood & Highland complex in Los Angeles. The restaurant serves up serves up a tasty mix of American cuisine, cocktails and rock 'n' roll. Earth Day is just around the corner on Friday April 22nd. There are many ways to celebrate like placing a recycling bin in your kitchen or going Meatless Monday (check out my article on Patch), or sign up for Picnic for the Planet sponsored by The Nature Conservancy. In celebration of Earth Day, people all over the world will be stepping outside and eating lunch in their favorite outdoor spot. 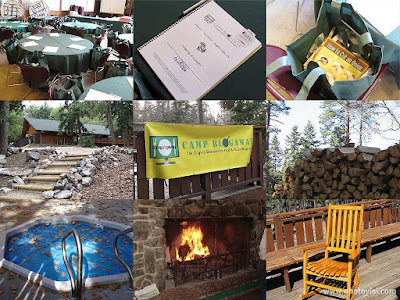 Looking for a local picnic meetup? Trying logging onto The Nature Conservancy's meetup page and join a local picnic happening near you, or start your own. Made fresh ingredients from the farmers market, this is my favorite salad to make. It combines creamy avocados with crispy radishes. The key ingredient is a generous portion of fresh lemon juice to finish the salad off. Enjoy! Layer the avocados and radishes in a bowl. Drizzle each bowl with half of the lemon juice and half of the olive oil. Braised White Bean & Andouille Sausage Cassoulet is hands down one of my favorite recipes to cook in the whole wide world. For this riff on the classic French dish cassoulet, I slowly braise white beans with spicy andouille sausage in the oven for 2 to 3 hours, finishing it off with a topping of breadcrumbs. I used Saag's Ragin' Cajun Sausage from their Naturals line, which are wonderfully spicy and flavorful. For you non-red meat eaters out there, the sausages are made from smoked chicken and turkey. They worked perfectly. This dish is the ultimate comfort food--rich and meaty. I also love serving it family style for a dinner party, placing the braising dish right in the middle of the table and letting my guests go at it. I promise there will very little left. While the cooking time is on the longer side (2-3 hours), the "active" part is relatively short. 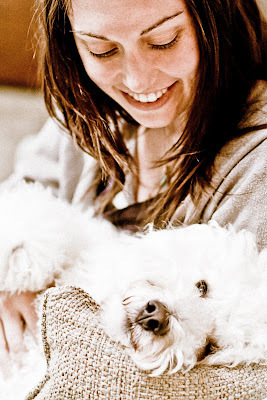 A little bit of Saturday fun for you -- here's a great portrait of me and my baby, The Adorable Monster, taken by Jay Brody, my brother-in-law. I just can't get enough of the gorgeous spring asparagus that's in season right now at my farmers market! It's thick, sweet, and juicy. Here's my favorite way to cook it up. First, I roast it in the oven, which really brings out the sweet flavor. I serve the asparagus with with a light shaving of parmesan reggiano and slices of lemon. It's simple, elegant, and delicious. 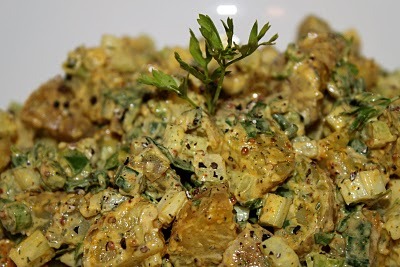 A great starting appetizer or side dish to any meal. Enjoy! Place the asparagus in a roasting pan and top with the olive oil. Roast in the oven for 15-20 minutes, or until the asparagus is lightly caramelized and tender, but not overcooked. Remove from the oven and arrange the asparagus on a serving platter. Grate some parmesan reggiano on top and garnish with the lemon wedges. There are few things I love more than bacon (just check out my posts about Zingerman's Bacon of the Month Club). So when I heard that Denny's recently launched Baconalia, their menu honoring all things bacon, I jumped at the chance to share my favorite bacon recipe. 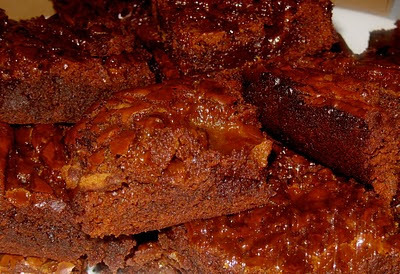 While I love using bacon in a variety of ways -- from throwing it into breakfast scrambles, to cooking it with corn and lima beans in a succotash, to sous vide cooking pork tenderloin in bacon fat -- my favorite is recipe is a dessert. I love combining bacon, chocolate, and caramel (Denny's has a new Bacon Maple Sundae, so they're on the same wavelength). For this special edition of Meatless Monday, click on over to West Hollywood Patch to view my recipe for Baby Beet Salad with Citrus Vinaigrette. This lovely salad combined roasted baby beets with a Greek-style goat's milk feta cheese, organic mixed baby greens, and sunflower seeds. The whole salad is topped with a light citrus vinaigrette. It's a healthy, delicious recipe that's perfect for lunch or a starting appetizer for a dinner party. Going forward, I'll be writing a regular column called "Farm to the Table" for Patch featuring weekly recipes based on my finds at the West Hollywood Farmers Market. So stay tuned -- I have some great stuff planned!